UPDATE 3PM: THE Capricorn Coast community have dubbed an act of vandalism of trees along the Scenic Highway near Cedar Park as deplorable. Residents expressed their anger on Facebook yesterday morning at the destruction of 34 mature trees that will cost $15,000 to replace with each tree costing $250 plus labour. "Some piece of ... (or multiple) has snapped all of the gorgeous new trees along Scenic Hwy near Cedar Park,” Karen McGrath wrote on Facebook. Livingstone Mayor Bill Ludwig said the vandalism was a slap in the face to the community. "This is deplorable act of vandalism and particularly when these plants were planted to help with the cyclone recovery and to revegetate after the destruction so to have destruction like this caused by somebody, who we would like to think is not a member of our community, is disappointing,” he said. Drone footage of 34 trees vandalised on Capricorn Coast: Drone footage of 34 trees vandalised on Capricorn Coast. Video supplied by Cap Coast Drones. "This is totally unacceptable and it's a real slap in the face for our community who've worked so hard on the recovery and all of our parks team. He said the trees had been planted over the last few months as part of the replacement for the damage done to streetscapes and trees during Cyclone Marcia. Cr Ludwig said the trees were also planted to ensure we start looking for that beautification and enhancement of our streetscapes a lot of them were planted to create shade as well for our walkers. "Our parks people saw it first thing this morning and we've had phone calls from members of the community expressing that they're appalled as well,” he said. Sport, Recreation, Parks and Community Facilities portfolio spokesman councillor Tom Wyatt said he was terribly disappointed in the people who've done it. "They're a bracket of 16 to 24 year olds probably coming home from the pub half drunk and they've tried to out do each other here,” he said. Anyone who has any information in regards to the incident should contact police. UPDATE 11.20am: A READER says there are actually 34 trees that have been vandalised along the Capricorn Coast overnight. It was reported earlier that 26 trees had been vandalised after reports on social media. Capricorn Coast residents took to Facebook this morning to vent their anger at the destruction of a row of recently planted mature trees. Livingstone Mayor Bill Ludwig will be addressing the media at the scene at noon today. It is not the time trees along the stretch of the Capricorn Coast have been vandalised. In July, Livingstone Shire Council reported a row of trees along Farnborough Road had been targeted. 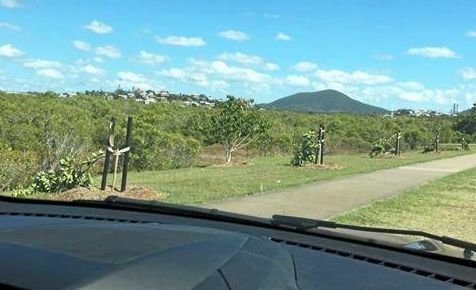 The trees were planted over the course of a few months before being vandalised - part of a project by the council to replace trees destroyed by Cyclone Marcia. A total of 500 semi-mature species have been planted throughout the Shire after the tragedy of Cyclone Marcia uprooted trees, flattened saplings and severely damaged vegetation. 9.20am: CAPRICORN Coast residents have taken to social media this morning to vent their anger at see a row of recently planted mature trees vandalised overnight. "Some piece of ... (or multiple) has snapped all of the gorgeous new trees along Scenic Hwy near Cedar Park. She wasn't the only one appalled by the vandalism. Angela Blom also posted on Facebook about the trees.